For the 1951 film, see Cattle Drive. A cattle drive is the process of moving a herd of cattle from one place to another, usually moved and herded by cowboys on horses. Cattle drives involved cowboys on horseback moving herds of cattle long distances to market. 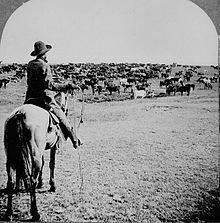 Cattle drives were at one time a major economic activity in the American West, particularly between the years 1866-1895, when 10 million cattle were herded from Texas to railheads in Kansas for shipments to stockyards in Chicago and points east. Drives usually took place in Texas on the Goodnight-Loving Trail (1866), Potter-Bacon trail (1883), Western trail (1874), Chisholm Trail (1867) and Shawnee Trail (1840s). Due to the extensive treatment of cattle drives in fiction and film, the cowboy tending to a herd of cattle has become the worldwide iconic image of the American West. ^ Longhorns at Home on Hungarian Range. Los Angeles Times. April 06, 2003. ^ "The Americanisation of the Outback: Cowboys and Stockmen", questia.com. login required. 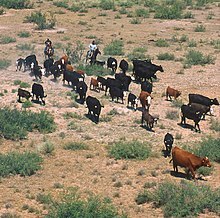 Look up cattle drive in Wiktionary, the free dictionary.